 and  Cereal-topped donuts and milk from Show Me The Yummy. and  Lactaid for everyone! 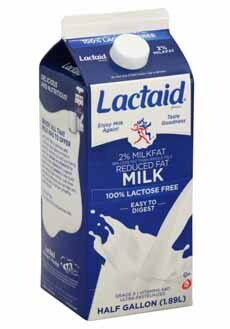 (photo courtesy Lactaid). March 7th is National Cereal Day, and here’s the big question: Do you drink the leftover milk in your cereal bowl? We’re one of them. We even pour extra milk into the bowl, just so we’ll have enough left over. People love cereal milk so much, that pastry chef Christina Tosi of Momofuku Milk Bar in New York City whipped up cereal milk as a standalone drink. Quirky? Yes. Tasty? Yes. Here’s a recipe to make you own. As a lactose-intolerant American, we just can’t enjoy nondairy milks—almond, coconut and soy milk, for example, on our cereal. Thank goodness for Lactaid. We live on their milk, chocolate milk, ice cream and cottage cheese. All are real milk products, neutralized with the addition of lactase (like Lactaid pills), which provides the enzyme our system no longer produces. We can drink and eat all we want, no Lactaid pill required. Lactaid sent us this special Milk + Cereal Donut recipe from Show Me The Yummy. Those of you who have no lactose issues can use regular milk. Prep time is 45 minutes, cook time is 10 minutes. We ate three of them today, and they are delish! 1. MAKE the donut base. Combine the milk and 1/2 cup cereal of choice in a small bowl. Let sit for 30 minutes. Meanwhile, preheat oven to 350°F and spray a donut pan or mini muffin tin with cooking spray. 2. WHISK together in a large bowl the cake mix, egg, oil, and milk-cereal mixture until well combined. Stir in the crushed cereal. 3. ADD the batter to the pan. 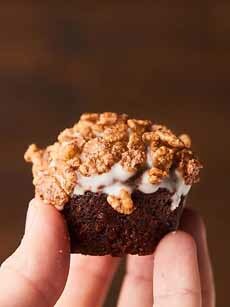 For a mini-muffin pan, use a 1 tablespoon cookie scoop to fill the prepared mini muffin pan. Bake for 10-12 minutes. For a standard muffin pan, make a small cut in the corner of a gallon sized Ziplock bag and fill with the batter. Pipe the batter into the prepared donut pan. Fill only halfway up or they’ll spill over. Bake for 10-12 minutes. 4. REMOVE from the pan and let cool. 5. MAKE the vanilla glaze and/or chocolate glaze. Whisk together glaze ingredients in a medium sized bowl until smooth. 6. 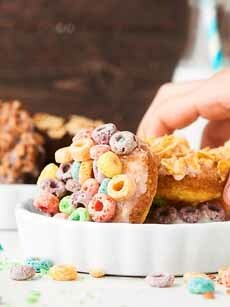 ASSEMBLE: Dunk the cooled donut into the glaze and roll into cereal of choice. Enjoy immediately! *The Lactaid Survey was conducted by Wakefield Research among 1,009 nationally representative U.S. adults ages 18+, between February 6th and 10th, 2017, using an email invitation and an online survey. Quotas have been set to ensure reliable and accurate representation of the U.S. adult population 18 and older.